Roll-On Equipment | CPS Resources Inc.
Fixture remains stationary while moveable stamping head decorates flat or contoured surfaces. Capable of decorating 360 degrees around cylindrical parts such as cosmetic cases, cups, flower pots and other similar parts. Applies Hot Stamp Foil or Heat Transfers to pen barrels and pen caps. The R-070 is also available in a Pencil Model. Various roll-on conveyor models from 6″ to 12″ conveyor widths. Used for stamping foil to flat surfaces on a variety of substrates. Applies decorative foil to flat surfaces on a variety of substrates. The roller height is adjustable to fit various part heights. Roll-On conveyor for stamping foil to flat surfaces on a variety of substrates. The R-1200 and CPS Conveyor Line of equipment decorates a wide range of substrates from leather to wood. Roll -On conveyor for stamping foil to flat surfaces on a variety of substrates. Applies Heat Transfers using eyemark registration on flat surfaces up to 18 inches in length. Capable of applying a wide range of Hot Stamp applications. 60″ wide roll on to apply decorative foils to large flat surfaces/substrates. Vertical roll-on application for round, oval applications with or without taper. 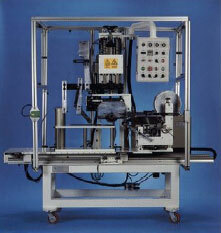 Vertical roll-on application with pivoting system. 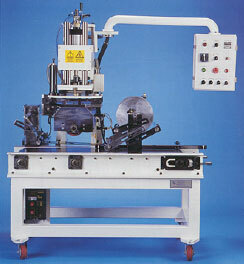 This machine decorates round, oval containers with or without taper. Offering two models of Hot Stamping machinery. View video of our equipment in our Equipment Video Library. Contact us to learn about our Custom Models! The R-300 Roll-On Conveyor applies decorative foil to flat surfaces on a variety of substrates. The roller height is adjustable to accommodate stamping different parts. The R-300 and CPS Resource, Inc. Conveyor Line of equipment effortlessly decorates a wide range of substrates. Some of those substrates include: leather, vinyl, plastics and wood. Machine Weight 550 Kg/1200 lb. This 48″ Roll-On machine can apply decorative foils to large flat surfaces up to 48″ wide and from 1/8″ to 6″ thick. The R-1200 and CPS Conveyor Line of equipment effortlessly decorates a wide range of substrates. Some of those substrates include: leather, vinyl, plastics and wood. The R-070 Vertical Roll-On machine is used to decorate 360° around cylindrical parts such as cosmetic cases, cups, flower pots and other similar parts. 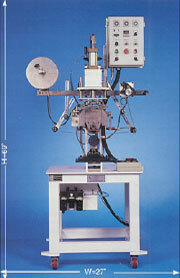 The Rotary Index Table, shown at the left, is an optional feature that can be used for increased production. Machine Weight 450 Kg/850 lbs. 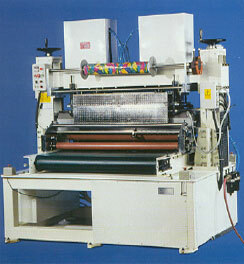 The R-070 Automatic Pen machine applies hot stamp foil and heat transfers to pen barrels and pen caps. The R-070 Model is also available as an Automatic Pencil machine which decorates pencils with hot stamp foil and heat transfers. This machine has a production rate of 25 Pens each per minute. Max Stamping Pressure 180 Kg / 400lb. Machine Weight 550 Kg / 1215 lbs. Production Rate 25 each / min. Max Stamping Pressure 250 Kg / cm2 / 500lb. Machine Weight 550 Kg / 1100 lbs. Production Rate 25 -30 each / min. 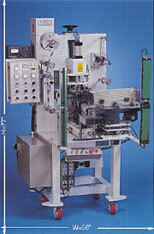 This machine is used primarily to apply Foil or Heat Transfers to elongated parts. The operation of the DRT-200 eliminates air entrapment during the foiling process. Pictured is the manual control panel of the DRT-200. The manual controls allow step by step operation for part placement and set-up. Max Stamping Pressure 250 Kg / 500lb. Machine Weight 850 Kg / 1875 lbs. Mandrel supported. A simple mandrel fixture supports the water bottle while the heat transfer is being applied. This eliminates the need to inject air in the bottle which has the following advantages: a) decreased cycle time, b) eliminates contamination from air inside the bottle. Air injected. Injects air into the water bottle in order to release the heat transfer design.